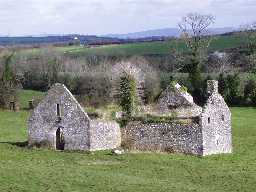 Friarstown Abbey is situated in a field through which the boundary of the parishes of Donaghmore/Knockea and Fedamore runs. The abbey is situated in the Knockea side of the parish. Clochnamanach abbey was repaired in 1932 and extensive ruins of the abbey remain. Clochnamanach is translated as Cloch na Manach, which means the stone of the Monks. The original foundation dates from 13th century and the Clan-Gibbons family erected it for the Franciscan Third Order Regular. They were lay brothers and arrived in Friarstown around 1450. However, there is no real documentary proof as to how long the monks stayed in the abbey but it is believed that the abbey was vacant by 1550. Mass was celebrated at the abbey by Bishop Donal Murray, with concelebrants Fr Oliver Plunkett and Fr Michael Cussen, on May 17th 2000.